What If Diamond Cancelled Your Comics Anthology And Didn't Tell You? That's what one company representative claims happened. 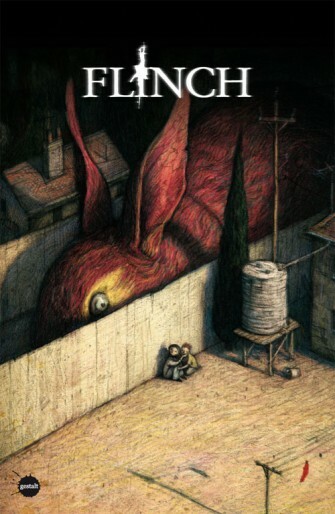 Gestalt Comics' Managing Director Wolfgang Bylsma wrote into CR earlier today to claim that their anthology Flinch was apparently canceled by Diamond Comics Distributor, Inc. -- by far the leading provider of books to the Direct Market of comics and hobby shops. What makes this stand out a bit in a year where a lot of small-press books have lost Diamond's support in accordance to their new minimums policy is that Bylsma claims Gestalt wasn't informed of this decision by Diamond but by the stores that Diamond had given this news. "I received an email from a retailer in Montreal asking why we were going ahead with our planned book launch in Melbourne, Australia when Diamond had canceled the distribution. Local retailers than confirmed for me that Diamond had informed them the title was canceled." The publishers plan on selling the book through Amazon.com and perhaps Haven Distribution. That's Shaun Tan's cover above; other contributors include Justin Randall and Ray Fawkes.